energy retrofit project development, insurance and financing. energy retrofits for any size project. Your on-demand energy retrofit portal. Search for commercial properties to retrofit, discover savings opportunities, get a business case, review financing options, develop the project. Use end-to-end energy retrofit analytics to develop your energy projects, insure the savings and get the right financing option. Find the best financing solution for your project and ownership situation. We offer PACE, ESAs, loans and leases, with insured savings. The HELiOS Energy Efficiency Exchange “EEX” is the world's first Commercial Real Estate database dedicated to developing, insuring and financing energy retrofits and other clean energy projects. The EEX is populated with over 150,000 properties, representing 15 Billion Sq.Ft. 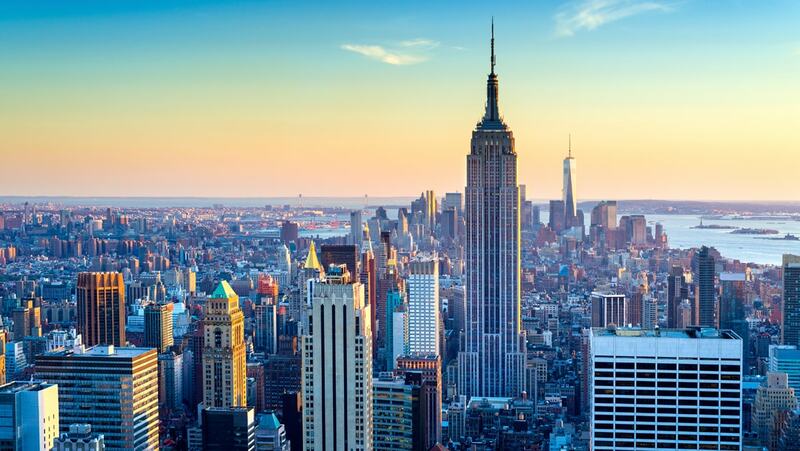 of commercial real estate in U.S. major cities such as New York, Los Angeles, and Chicago. 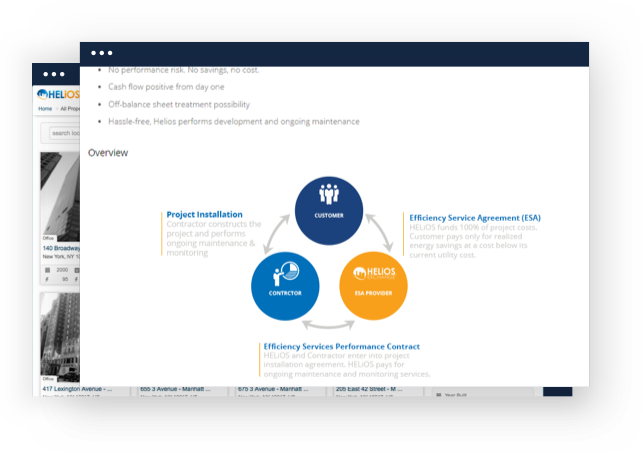 Search and discover energy retrofit opportunities and get a free business case and analysis of how to get the project financed and insured. Discovery: You don't know how your building uses energy. 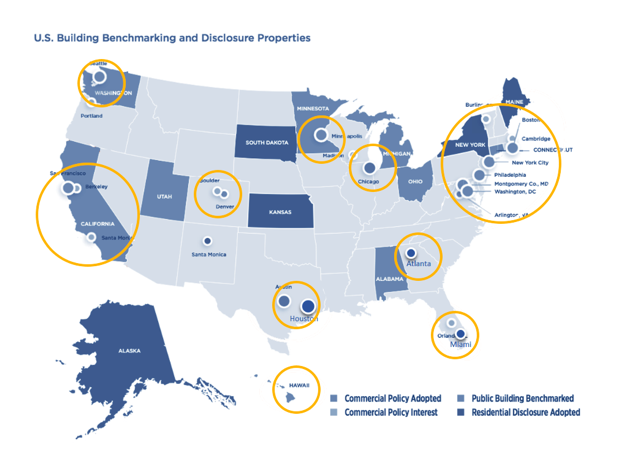 Exploratory: Your building energy performance has been benchmarked through Energy Star Portfolio Manager. Remote Energy Audit: Share some information about your building systems and operations to identify potential Energy Efficiency Measures. WHAT IS OUR GEOGRAPHIC COVERAGE? HELiOS-EEX takes advantage of City Energy Disclosure Regulations. Whenever energy use is disclosed, Helios has already identified energy retrofit opportunities and has created a business case in HELiOS-EEX. We have also anticipated cities and states that are in the process of implementing a disclosure program. Inaddition, large cities where PACE programs exist or where energy costs are very high have been added to the HELiOS-EEX. This is our starting point. We are planning to extend our geographic coverage, including Canada. 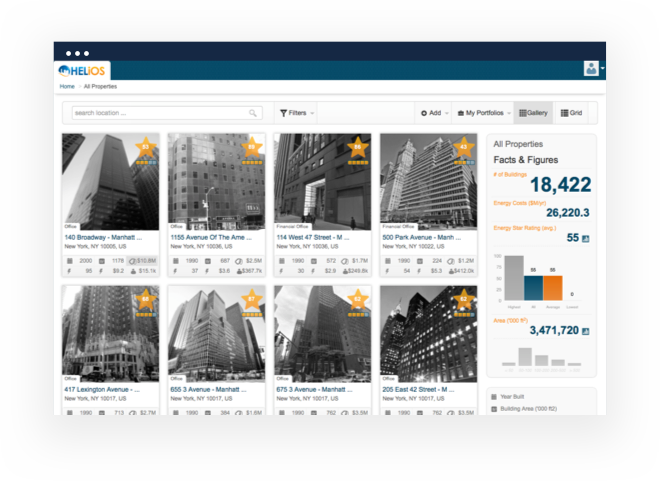 If you own or are working on a commercial property that is not currently in HELiOS-EEX, you can simply add it. We have no limit in terms of building size, type or location, as long as it is in the US. For specific requests, please contact us. HELiOS provides a wide range of financing solutions, so that building owners can find the one that best suits their own situation and cash position. HELiOS financing products are designed to overcome the two highest barriers to energy retrofits, i.e. lack of budget and lack of confidence in the savings. HELiOS Financing products ensure that the projects are cash flow positive to the building owner from day one. We offer PACE financing, Efficiency Services Agreements, as well as more traditional loans and leases. 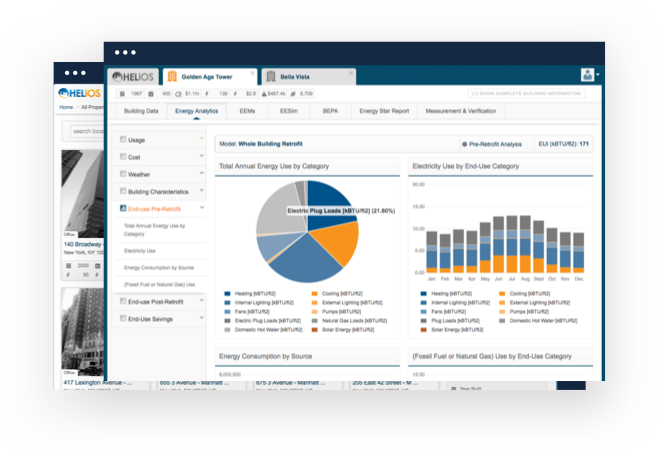 HELIOS provides end-to-end building energy analytics for Energy Professionals to support the development, insurance, and financing of commercial building energy retrofit projects. Our web-based solutions include: Building Energy Performance Assessment, Remote Energy Audit Tool, Energy Audit Support, Rapid Building Energy Modeling, Energy Retrofit Simulation, Energy Efficiency Risk Analysis, and Measurement & Verification. HELiOS is a proud software partner of the Investor Confidence Protocol. Standardized building energy performance assessment and energy retrofit analytics. Projects due diligence and performance risk assessment.